But first: remember when me talked about Ecomare? Me have seen a beautiful seabird there called Jan van Gent (gannet). It was there because he was injured and the people of Ecomare kindly nursed it back to health. 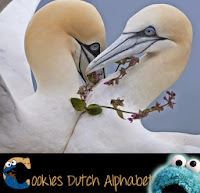 The Jan van Gent birds live around the North Sea and around the Dutch island of Texel. 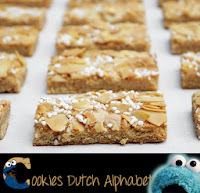 On this island they have a specialty called ‘Juttertje’, named after the strandjutters (beachcombers). It is a hearty liqueur you can compare with other herbal liqueurs, like Beerenburg and Jägermeister. 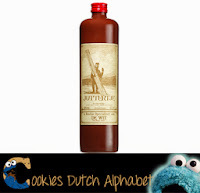 Also other regions of the Netherlands have herbal liqueurs. It is not for little blue monsters though. 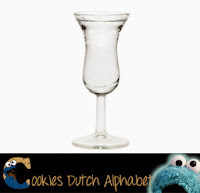 Just like the Dutch Jonge Jenever (young gin). Me rather talk about food though. 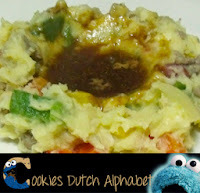 The Dutch love to put a little jus (gravy) on their dinner. Especially when they eat stews like hutspot. They make a little pit in the middle of their food and fill it up with gravy. 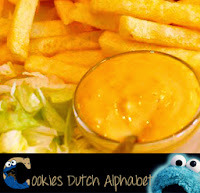 Another sauce that is very Dutch is joppiesaus (joppie sauce) and it is used on snacks like fries and such. It is some special kind of yummy mayonnaise. Well that concludes the letter J. Me cannot wait for next week. O boy O boy O boy what a week that will be!